FILE - Human rights activists hold portraits of victims during a demonstration to commemorate the 1915 mass killing of Armenians in the Ottoman Empire, in central Istanbul, Turkey, Apr. 24, 2018. As the world marks the 100th anniversary of the end of World War I in 1918, some in the Middle East mourn the fate of nations and peoples who came out losers in the ultimate dissection of the region and the division of the Ottoman Empire. 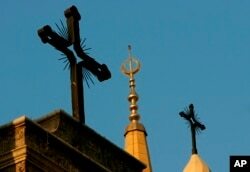 FILE - A minaret of the Mohammed al-Amin Mosque and two crosses on top of the Maronite St. George Cathedral are seen in downtown Beirut, Lebanon, Sept. 17, 2006. 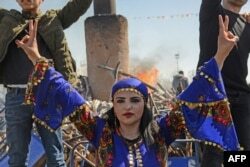 FILE - A young woman flashes the victory sign in front of a bonfire as Turkish Kurds gather during Newroz celebrations for the new year in Diyarbakir, southeastern Turkey, on March 21, 2018.